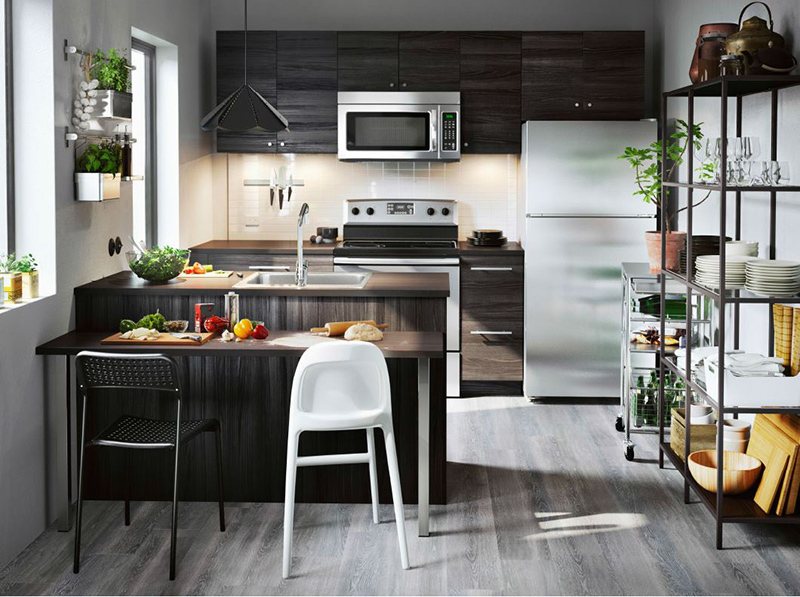 Complete a condominium's look with modern kitchen furniture. Kitchen is the heart of home; we often hear these words when describing about a space where we use to prepare our food. This is true most especially to those people who love cooking and preparing food for themselves or for their whole family. 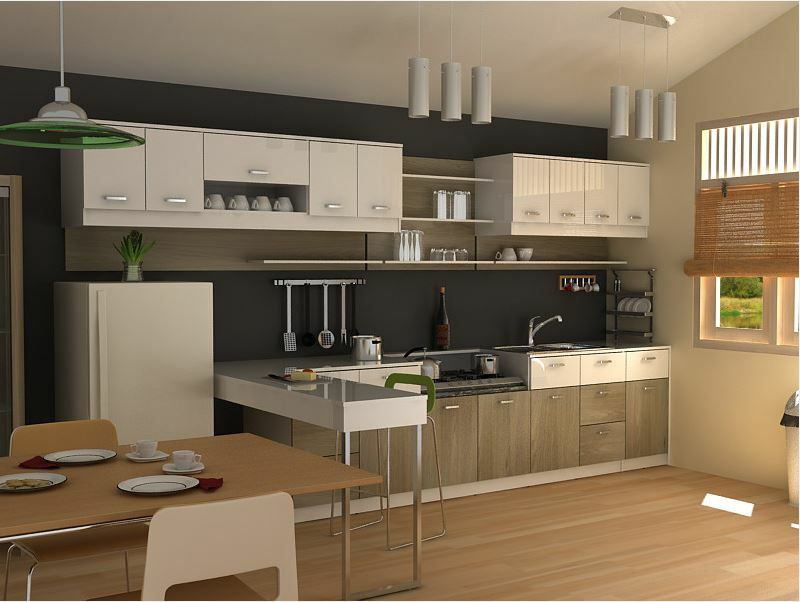 In modern homes especially in condominiums, kitchen is already defined. You can see it with the built-in cabinetry and sink with faucet that pretty much says “this is the kitchen” stuff. In some units it may be small but there are also condos that offer an ample space for all rooms. 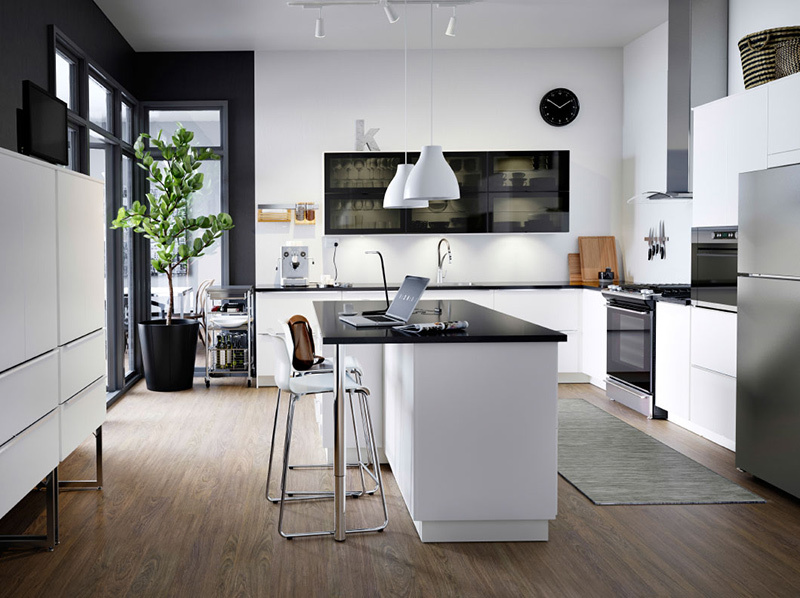 Big or small modern kitchen should offer versatility and entertainment at the same time. Versatile to serve as a dining area for those times you feel casual and intimate, and entertaining enough to cater those times you invite guests to cook with you or help you out with kitchen work and still have that fun vibe without stress at all. 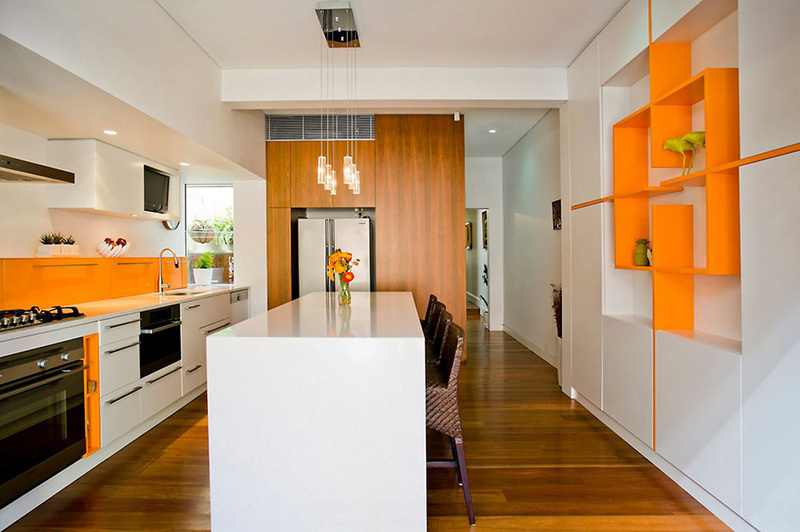 Modern kitchen furniture may bring repetition to the whole space which basically means consistency in style and design. It is well-integrated and shows unification in every sense. It has less adornment but it plays with lines and fabulous textures and materials. It does not necessarily mean – no to colors, but mostly you will see white, black and gray as the commonly used hues for this kind of style. 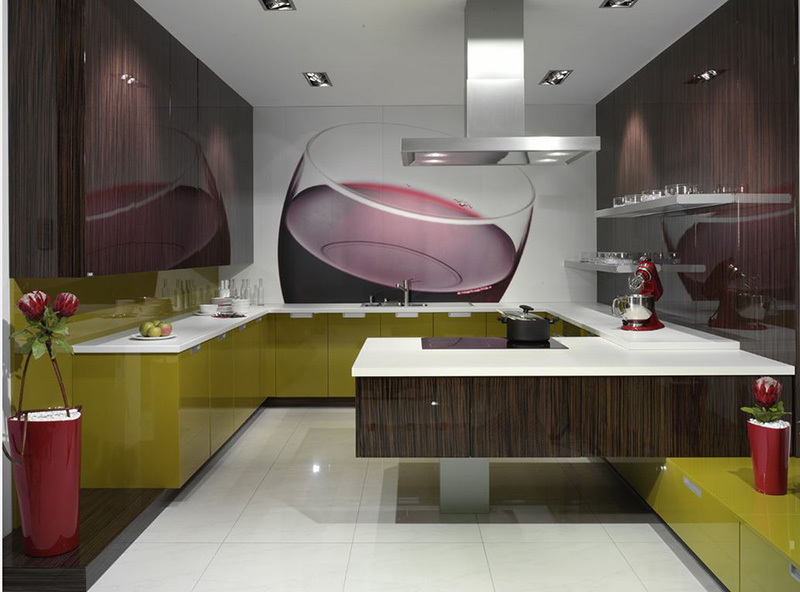 However, using bold colors on your kitchen furniture can also give a striking modern punch to your interiors. So here you go, check these 20 modern kitchen furniture that will not only make your kitchen stylish but will also provide great use and personality to your home. A combination of stylish beauty and functionality, this open-plan kitchen has all the modern elements. The white glossy cabinets with stainless steel highlights, paired with grain rosewood floating cabinet which serves as a buffet to the dining area and storage at the same time, keep this space, warm and quite futuristic. In this modern condo kitchen design, the crisp, white flat-slab Italian cabinets are paired with high-end stainless steel appliances. It looks neat and so minimalist except for the pop of colors from the fruit display. The clean lines and monochromatic appearance of the space gives that modern vibe. 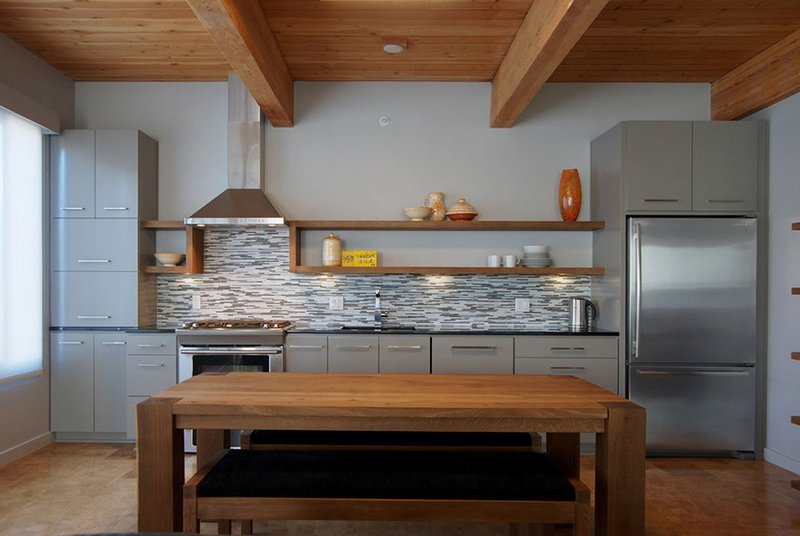 A combination of flat-slab cabinets and open shelving looks fantastic. It creates an airy and open feel to a small space. The touch of wood tone adds warmth to the whole modern space. A kitchen bar can double as a dining table or a kitchen island when the need arises. In a limited space, it is good to have more room for storage. Huge furniture with slender legs, is a good choice. Keeping the floor seen creates a floating illusion, making the room airy and open. Look at the stand on the stool bars, kitchen cabinet and kitchen trolley- those are all stainless steel that creates openness and airy feel. This is an example of an eco-friendly kitchen layout. 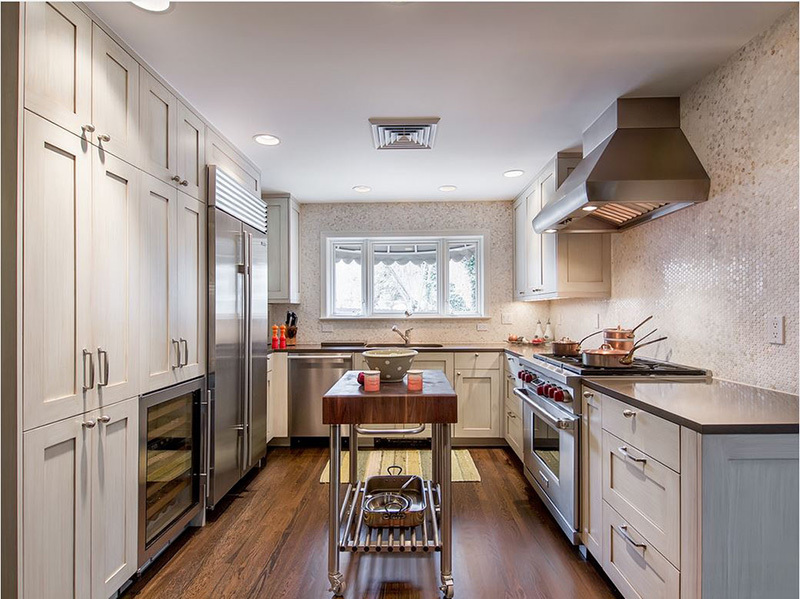 The flat-panel cabinets, light wood cabinets, stainless steel countertops, stainless steel appliances and a solid island with rolling castors are both functional and stylish. The mobile island can be easily put away whenever you needed more space for your kitchen. I love the dark gray finish of the backsplash and cabinets. It really sets the tone in this modern kitchen. It brings drama and interest that beautifully contrasts with the white ceiling and walls. The wood note keeps the balance and brings warmth to the whole space making it inviting. Plan cabinets up to the ceiling are an efficient way to use space and you can fit more storage for your kitchen. Bench bar stools that can easily be tucked away when not in use is a great solution for those who are opting for a stylish kitchen but is limited in space. 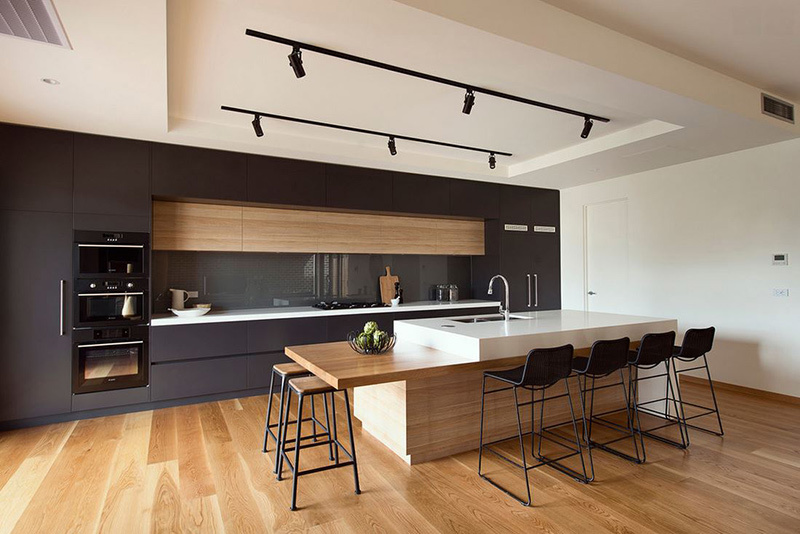 In this modern kitchen, functionality and style were considered. The wood cabinets, though modern in style gives warmth and character. The modern kitchen island has sink and cabinets with solid countertop giving multi-functionality. The Robin’s egg blue cabinets has long, wide horizontal lines accentuating the stack of drawers giving it a refreshing and modern look. The floating panel of the back wall and the cutout create a striking statement. Right lighting makes this modern kitchen cozy and sassy. I love the masculine touch in this kitchen! 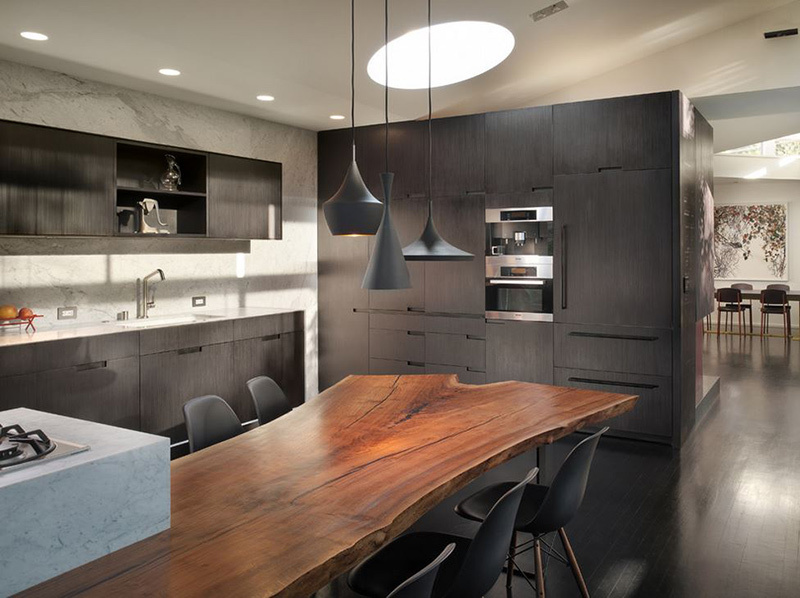 The black flat-panel cabinets, echoing on the floors and pendant lights lending drama to the whole space. The stone slab backsplash, white ceiling and the recessed lighting with a round skylight keep the whole kitchen well-lighted and bright. The pop of blue in this kitchen brings fun and chic appeal. The extended kitchen island that is used as a dining table with open shelves for support is a smart solution to maximize your kitchen space. 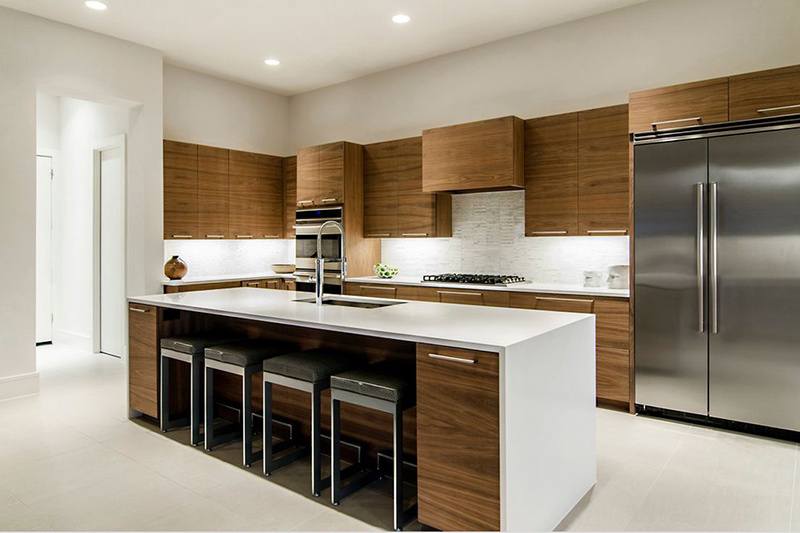 This kitchen is so sleek, modern and with personality! Not to mention the functionality that you can get from these kitchen furniture, it is all incredibly done to perfection. 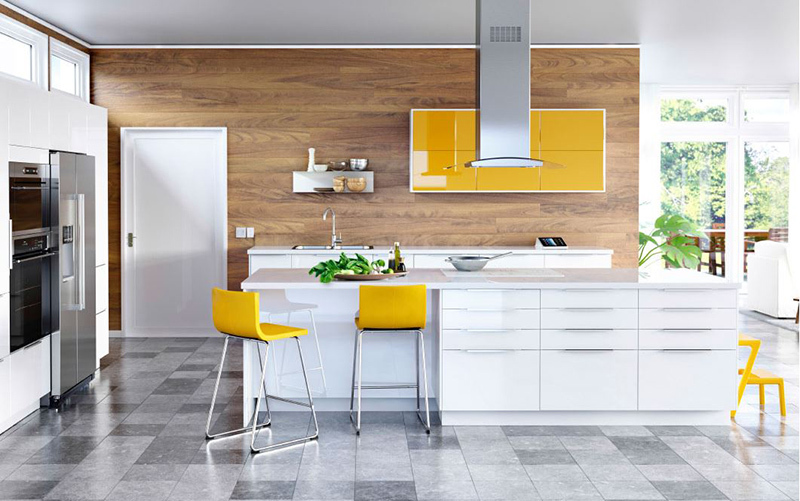 The hint of this sunny yellow from the bar stools and floating wall cabinet, instantly create a happy mood! The crisp, white cabinets and kitchen island that extends as an instant bar or dining table, make a functional and cohesive look in this minimalist space. For those kitchen with counter space covered and appliances tucked against the walls, one good solution to keep the space from getting bulky is by adding a dining set that coordinates with the kitchen color scheme to blend in. Like in this photo, the flat-panel cabinets and the appliances are well-tucked against the wall, giving a spacious and airy feel. Adding a sturdy and bulky island would only crowd the limited space it has. I love the simplicity and clean lines of this kitchen. The industrial appeal gives it instant modern vibe, while the woodsy tone from the open shelves and dining set bring warmth and coziness. 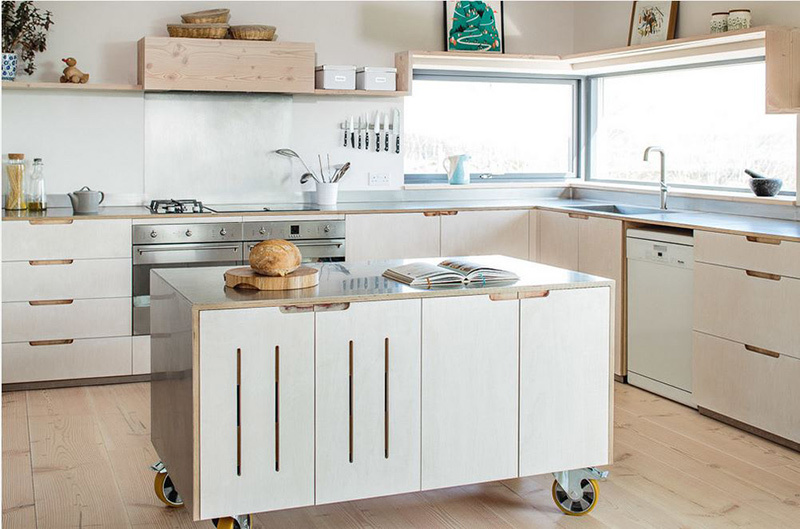 In this U-shaped kitchen the kitchen trolley gives the modern vibe and striking statement. This trolley serves as a kitchen island and when paired with bar stools can also function as a kitchen bar or a dining table. This dark brown kitchen exudes personality and intrigue. The flat-panel cabinets dictate the mood in this space, while the stainless steel appliances give a cool effect to the whole scheme. It somehow illustrates an industrial design that makes it refreshing and modern. The kitchen island with sink extends to create a bar perfect for eat-in kitchen style. 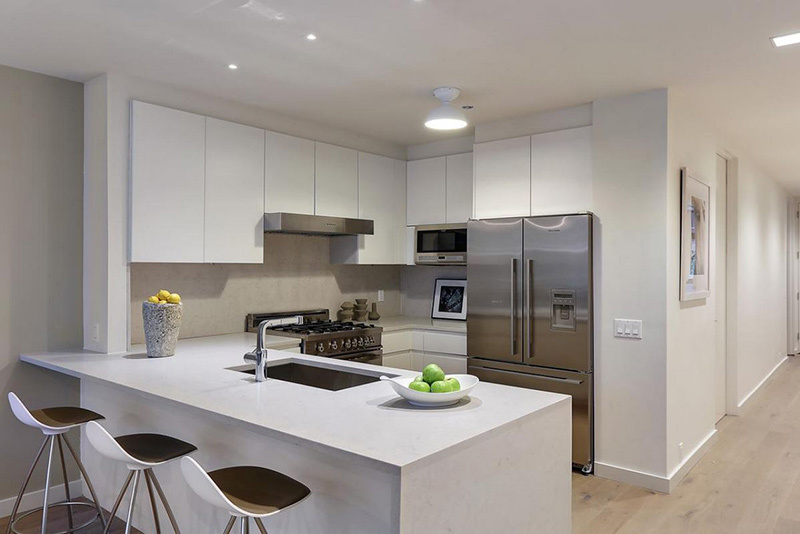 For condos with limited kitchen space, adding cabinetry that goes up to the ceiling, shelves floating on the wall and furniture with slender legs that let you see the floor will go a long way. It will provide you ample of space to store kitchen necessities and save more space. This kitchen is luxuriously modern and chic. 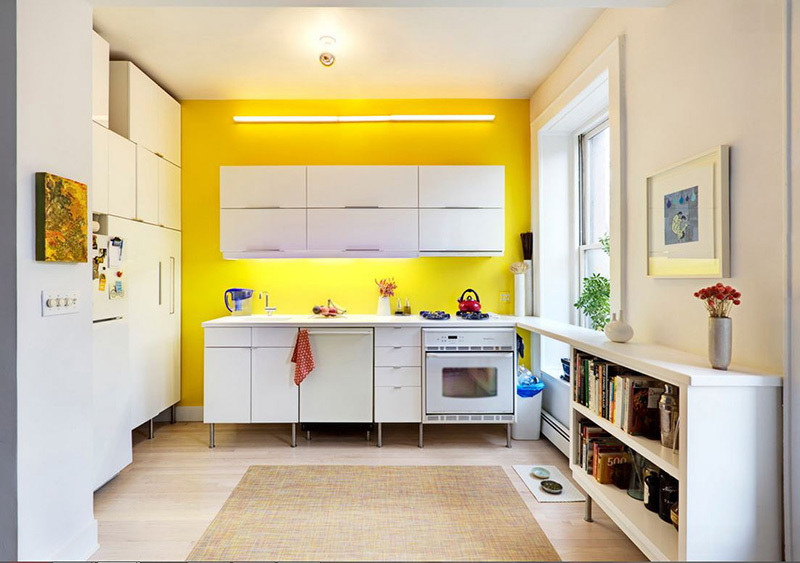 The vibrant colors of the flat-panel cabinets bring a fun vibe while the dark wood note adds warmth. 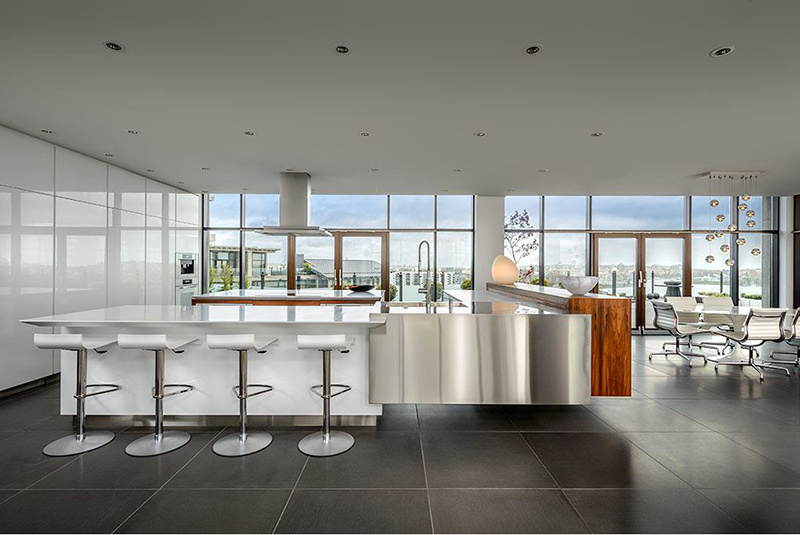 The floating kitchen bar creates a futuristic appeal to this space. I love the bright orange shelves on the walls! It brings fun and bold statement to the whole kitchen space. Open shelving is great for small spaces. This is one of my personal favorite kitchen style here in my list. There is just something about the industrial look that gives a modern vibe. 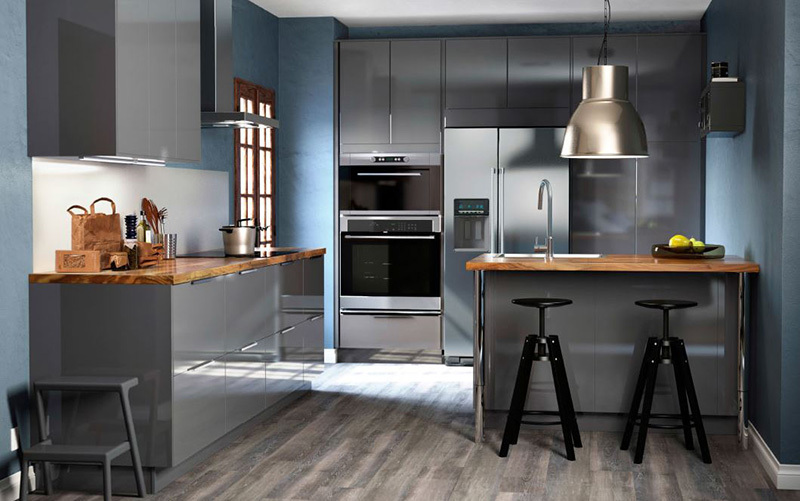 The stainless steel appliances blend perfectly well with the sleek gray cabinetry. Creating a kitchen space with personality in your condo, whether you have the luxury of a huge space or not is just easy. All you need to do is just learn the basic elements of how modern kitchen furniture look like. Modern furniture is all about frameless look, hence the flat-panel cabinets. If you notice it, all modern cabinetry looks the same. 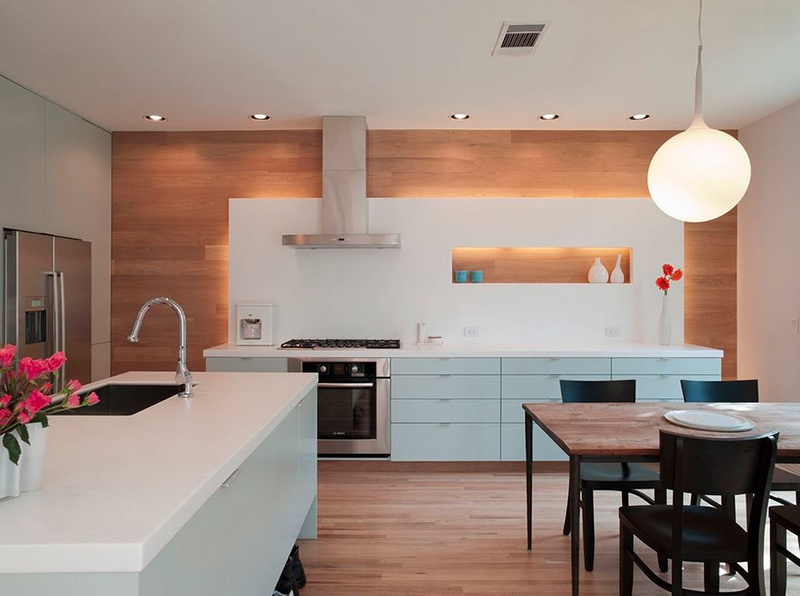 Modern kitchen furniture also tends to love clean lines. Horizontal and vertical lines are common factor in modern kitchen furniture. It is also about monochromatic palette and sleekness. The most important thing is to keep your kitchen well-lighted. So plan your lighting well. After all, you do all your food preparation in the kitchen, so giving it ample amount of light and brightness will make things go smoother.